Wireless AV transmitter for long range transmission - 1.2GHz 700mW. This mini and light-weighted wireless	microwave transmitter enables you to send video between locations where hardwiring is difficult or impracticable. Applications include sending FPV camera video to the receiver on the ground, sending video between buildings across the road and so forth. It works with most video cameras with RCA or BNC AV outputs (NTSC and PAL auto detect). The device works on microwave radio system - no internet/network or WIFI connections required. See a typical setup example here. The transmitter is small, light-weighted and can be powered by a 12V battery pack for a couple of hours. Suitable for portable or FPV drone applications. Transmission range: Range may vary substantially depending on the actual operating environment. Up to 150 meters (500 feet) open space with the included antennas. 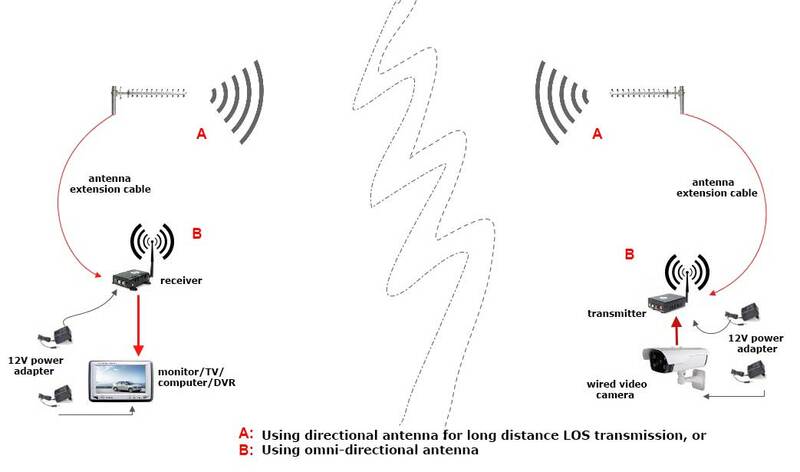 Much longer distance can be achieved if high gain directional antennas are installed in a line of sight environment. AV signal can travel through some obstructions such as wall, partition, tree and so forth but in this case, the transmission distance will be reduced depending on the type, materials and the number of the obstructions in the transmission range. 1) Send video wirelessly from a surveillance camera or camcorder to TV, monitor, computer, DVR. 4) Send video from a camcorder to a nearby monitor or DVR. 5) Send video from a FPV drone back to the ground. Transmission distance Distance may vary substantially depending on the actual operating environment. Much longer range can be achieved in aerial applications. Normal line of sight transmission range up to 500 feet (150 meters), or 1 mile (1.5 km) with Yagi or other high gain directional antennas. 3) If it is necessary to use antenna extension cable, the cable should be kept as short as possible because, the signal attenuates directly proportional to the length of the cable, i.e. the longer the cable, the weaker the signal from the antenna. To minimize the signal attenuation, you may extend the distance between the transmitter/camera or the receiver/monitor by using high grade 75 ohm coaxial video cable such as RG6 cable. See an illustration here. 1) 4-channel 1.2GHz AV transmitter. **UPS delivery option is not available for these antennas except panel antenna.